In the foreground sits a brindled ox with its left horn trained to grow across its muzzle, a deformation called ma gut. This was carried out by initiated youths on their favourite beast for aesthetically pleasing effect. 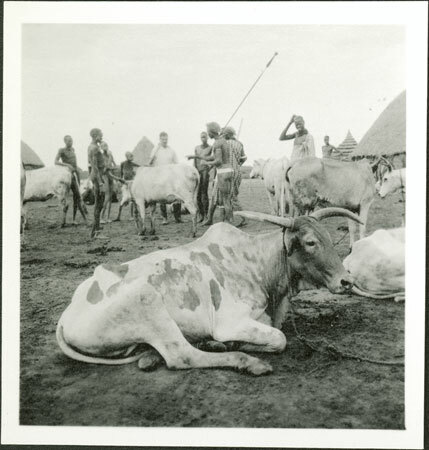 In the background an unidentified European man (possibly the administrator Frank Corfield) is discussing a cow with a group of Nuer. To the right of the gathered Nuer can be seen a man wearing a body cloth and black neck ornament, bearing a strong resemblance to the youth wearing shorts at a cattle camp in Plate VIIb of The Nuer, described as Lou country. Note on print reverse ms pencil - "78 2 297"
Morton, Chris. "Nuer ox" Southern Sudan Project (in development). 03 Jan. 2006. Pitt Rivers Museum. <http://southernsudan.prm.ox.ac.uk/details/1998.355.546.2/>.